Writes sci-fi, fantasy, and horror and doesn't care who knows it. Between starting a new job and a powerful, persistent Crisis of Writing Faith (TM) I went months without reading, writing, or submitting. Which is not a good strategy for achieving strong writing stats. That’s not to say nothing happened–I had a lot of cool achievements throughout the year, almost entirely thanks to work I did in 2014 and earlier–but I’m really hoping to get my submissions train back on the rails in 2016. BUT $ERIOU$LY, HOW WA$ 2015? The big change to my writing income was that I started making book covers. (In case you needed additional evidence that there’s more money in selling services to writers than in writing, but I digress.) I ran a series of blog posts wherein I practiced for free in public, then made a bunch of premade covers and got some commissions. 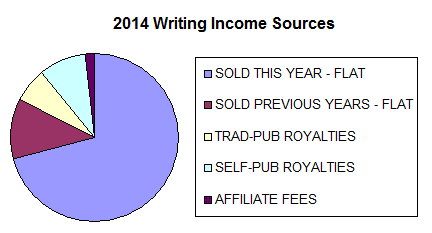 It’s a skill I’m glad I started learning, and as you can see in the pie chart, a pretty nice boost to my writing/publishing income. “Sold Previous Years” means I logged the sale prior to 2015 and only this year got paid for it. “Flat” means I was paid a flat rate, i.e. not royalties. And check out those affiliate fees! Amazon Associates has been pretty good to me. If you have a website that you link to Amazon from–even a Twitter!–you should sign up. It’s a trickle, but it ain’t nothing. Those numbers are pretty similar to 2014, for the record. I didn’t do a particularly good job with keeping my pieces in circulation this year, and a lot of those rejections were for poems sent 3-5 at a time. Not only that, but I’m almost out of inventory. Despite myself, I did make some sales–including some pretty neat ones. You guys! This year my work was podcasted, included in a Year’s Best anthology, reprinted in gift-edition hardback alongside hilariously famous classic horror authors, and translated into French. That’s neat! AND HOW WAS THE WRITING THIS YEAR? Dreadful! I wrote all of, what, four short stories (two for Rhonda Parrish, bless her heart) and a couple poems? I did finish one novel edit and make serious progress on two more, plus I put tens of thousands of words into novels that remain unfinished. Like many elements of this blog post: it’s not nothing, but it’s not what I expect of myself. SO WHAT’S THE PLAN FOR 2016? The big goal is to have two of my YA fantasy novels fully revised by World Fantasy Con, which I’m attending with Megan Engelhardt. (It’s my birthday weekend, and next door in Ohio! YOU SHOULD COME.) That will put me at three query-able manuscripts. Meanwhile, I’d like to return to #10bythen, or ten submissions per month. I’ve also got an adult fantasy novel to complete, and I hope to spend NaNoWriMo 2016 on original work instead of rewrites. Then there’s the whole “actually producing new stories and poems” thing which I hear is PRETTY INTEGRAL to selling new stories and poems. Link me your 2015 stats post, or tell me in the comments what you accomplished! I learned to love making book covers. This year I really opened up my writing revenue streams by reprinting some of my work to Kindle, Smashwords, and QuarterReads. They’re not STRONG revenue streams, but they’re not nothing. I slipped into WorldCon for a day and WFC for three, which was 100% delightful on both counts. You guys are so great in person!! I underwent a thorough and harrowing fifth revision of a certain novel, which is nearly done, at last. I am way happier with those numbers than I am with last year’s. They’re more in line with what I like to see from myself. Those sales include five stories to pro-paying markets, four audio reprints, two poetry sales, and, fingers crossed it comes through, a foreign translation reprint. BUT HOW DID THE WRITING GO, AMANDA? I had a weird year! I got about 110k new words written, which has been my yearly pace for a very long time now. (Last year was a fluke.) That pace delivered me about 17 finished shorts and poems, another 25k on last year’s novel, and an embarrassing assortment of unfinished nonsense. Did I mention revising nearly an entire novel for the fifth time? SO WHAT’S UP FOR NEXT YEAR? I’m aiming for what I consider a fairly easy 3k/week pace, which will still wildly increase my output of new words, depending on how hard I cheat. I have quite a few unfinished and imperfect stories to whip into shape. I’m planning to complete my adult fantasy novel, rewrite one other YA fantasy novel, and start seeking an agent for the YA fantasy that’s nearly done. I plan to keep up with #10bythen, or ten submissions per month. (I assume saying all this will help me actually do it.) I don’t have any convention or additional self-publishing plans, but who knows what will come up. Link me your 2014 stats post, or tell me in the comments what you accomplished!